Anyone who has read my blog for more than a couple of weeks knows how much I detest leaving my house to “go shopping”. I do it for groceries, clothing that I absolutely must try on, and an occasional gift that I can’t find online — but that’s about it. I buy everything else online, from the comfort of my home, after children are sleeping, when I can think clearly and make sure I remember everything I’m supposed to buy! Another thing I really don’t like is doing anything manually that I could automate. I’m always looking for products and services that allow me to automate any part of my daily, weekly, and/or monthly routine, because in my opinion, “automatic” = “simpler”. I’ve already shared how we automate almost ALL of our finances — from the auto-deposit on our paychecks and the monthly auto-transfer to our Roth IRAs, to the utility bills that are automatically charged to our credit card and the credit card that is automatically deducted from our checking account. I also automate many of my Amazon.com purchases with Subscribe and Save (things like diapers, wipes, snacks and baking supplies) so I never forget, never run out, and never need to make another trip back to the store. I just open my front door and bring the boxes inside. 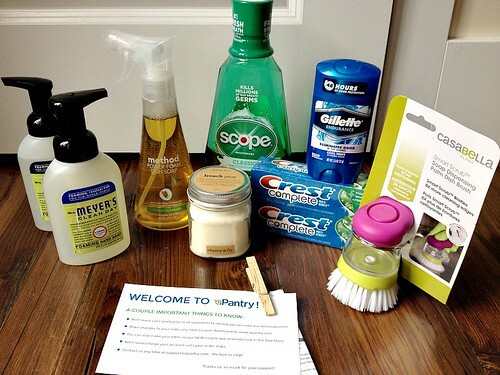 Knowing my preference for online shopping and automated systems, it’s no huge surprise that I was immediately drawn to ePantry.com — an online company providing super fast and automated home deliveries of hundreds of different cleaning products, paper products, toiletries, and other personal items. ePantry.com has no membership fees, no contracts or long-term commitments, free shipping, free return shipping, and a no-hassle return policy that is 10 times easier than any store I’ve ever worked with. They offer a huge variety of natural and organic brands as well as everyday brands we’ve all come to know and love. Oh, and they have AMAZING customer service (seriously, top notch). So… How Does ePantry.com Work? Once you create your FREE ePantry.com account, you’ll be asked a few questions about the number of people in your home, how many bathrooms you have, what types of brands you like, etc. etc. After those questions, ePantry.com “magically” comes up with a product list that they think would best fit your needs. Of course, you can add and remove products as you like — they have so many brands and types of cleaning product and personal care product to choose from! Once you have your “shopping cart” loaded up, you simply authorize the payment… and in a couple of days, the items arrive at your door step. This is just an example of one of my recent orders. 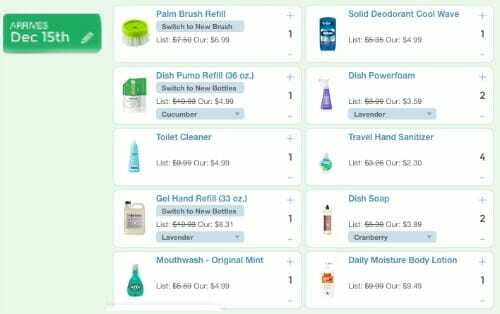 The super cool thing about ePantry.com is that based on your current order, they will predict what products you’ll need in future months — and then set up a schedule of shipments to keep you fully stocked up on toilet paper, paper towels, hand soap, body wash, dish soap, household cleaners, laundry detergent, razors, lotion, and more! For example, my most recent shipment included hand soap (among other things). And based on the number of bathrooms and people in our house and the number of times we wash our hands each day, ePantry.com estimates that we’ll need a hand soap refill in 2 months — and yes, they are smart enough to send a REFILL instead of 3 more bottles of hand soap (thus saving me money and saving on packaging). I know it’s hard to see, but this is what they are suggesting for my next shipment on Dec. 15. But don’t worry, you have FULL control over all future orders and ePantry.com will send you an email or text message one week before your next shipment is scheduled to go out so you can review your cart, remove items, add items, push the shipment back 2 weeks, or simply cancel the entire order. 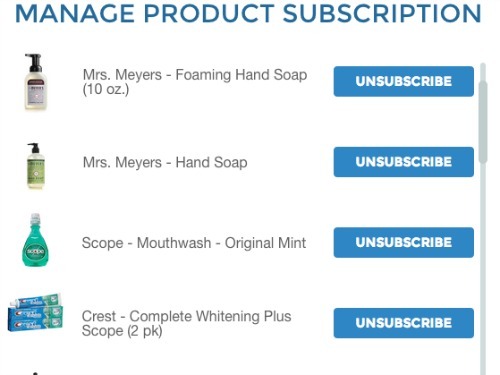 You are NEVER locked into anything and you can always “unsubscribe” from any products you’re no longer interested in! Are the Prices Comparable to the Store? I realize this is probably the #1 concern for most of you — it was for me too. I’m all about convenience and saving tons of time and energy by ordering items online. However, I’m not going to pay 2 or 3 times the price. If you are currently playing “the drugstore game” and pairing multiple coupons with sale prices, rebates, in-store rewards, cash-back Apps, etc. then yes, ePantry.com is going to be more expensive for you. $10 off your purchase + a FREE Mrs. Meyer’s hand soap! IMPORTANT: This offer is only available through my blog until 3pm EST, 10/27/14! I hope you’re able to find a couple deals for yourself (or maybe a gift for a friend), score a free hand soap, and enjoy the ease and simplicity of shopping from your home when it’s convenient for YOU! What’s your favorite thing about online shopping? note: The links in this post are referral links. Read my disclosure policy here. I was loving this service at first, but now they are charging shipping unless you become a VIP member. Since my kids aren’t little and we have an Amazon Prime membership, this is not as great an offer as it was when you could meet a minimum order size. Love that you share opportunities like this, wish they didn’t change things right after running big promos with bloggers. hmmm… that is odd. I thought it was always going to be free shipping if you met a minimum order amount (like Amazon). I just tried checking to see how much a VIP membership was but couldn’t find it at a quick glance. I’m working on an order now. So strange I signed up yesterday on my phone. Then today logged in, but accidentally used a different email so it made a new account. Finally figured it out and went on the first account that I created from your link. That one had lower prices! By about $2 per item, and is a huge savings versus target or regular stores (i’m getting method and mrs meyers products). Not sure what happened but I thought that was strange? Because if these are the normal prices from epantry I’ll definetly order again. But the higher prices maybe not. I’ve got 5 kids, and my youngest (2 in december) hates shopping carts. So trying to shop with her in stores is NOT fun (I have to carry her and push the cart). LOVE online shopping. hmmm… that’s SUPER weird about the prices. Maybe I’ll email them to let them know. Do you have screenshots to show the difference in price for the same item? No screenshots, I guess I could try logging in using my 2nd account to see the higher prices? oops, didn’t mean to type the spray. the all-purpose cleaner. The kind in the big bottle. I mix that with water in my own spray bottle and it lasts for a pretty long time. no worries — don’t waste time logging into your other account. It might be a deal through my link that I wasn’t aware of — but either way, that IS a great deal! Thanks for the referral, Andrea! (I couldn’t resist the free soap!) I am all for automating as much as possible too, although with just my husband and I, we don’t really need too many household items that often or in bulk, so I usually just rely on occasional trips to Target (won’t buy that stuff in the supermarket). However, I always seem to spend more than I planned when I go to Target, and what I need is not always on sale when I need it. For the most part, I’m in total agreement that if I can avoid going to a store, I will, which is why I love online shopping! Much more convenient for me…I also got an additional $2 off the order I just placed for answering a question in their chat window, and I like the fact that they automatically offset the carbon footprint of their shipping (however that is done). Cool site! I just signed up! I don’t know that we’ll continue with it past this month, but I just got a great deal on razor blades + free soap 🙂 Thanks! yay — and yes, I love that there’s not long-term commitment or subscription. Just buy what you like… and if you want to stop buying, then stop. If you need another order next year, you can buy more again. Oh I am SO excited! I am really working on automating my life and this would tie in so nicely with what I am doing with Amazon. Thanks for the great resource! Wow what a neat idea. I did not know this company even existed. I do have a couple subscriptions on Amazon for my motorhome sewer treatment chemicals. I try to buy only food at the grocers so this is perfect for the stuff I would have to drive 20 to get at Target. I am with you on the online shopping. And I am now on a first name basis with my UPS guy! The last thing that came was a box of Mr. Clean rubber gloves which are not in any stores around here now. Thanks Liane — hope you find a couple deals today!! I couldn’t see where to search without signing up for sight…do they have personal products? Specifically the test sticks for the clearblue fertility monitor? I don’t believe they have those test sticks — however, you can see all the products they offer by clicking on the “tour” link in the top menu bar! I think their laundry soap might be a bit more limited the the other categories — however, they have hundreds of other products (including candles, paper products, food storage containers, dish cloths, etc.) — those would even be fun gift ideas! I just put together a little “house warming” package for a friend with a couple candles, dish soap, dish sponges, dish rags, etc. I would encourage everyone to browse around too, I received credits of an additional $3 as I was searching for items and interacting with different features and categories. I’m looking forward to trying this as I loved the idea of Amazon’s subscribe and save but the quantities were often worse than shopping Costco. YES Tammy! I was going to mention that in the post — but wasn’t sure if it happened every time or not. I too have gotten several dollars of extra shop credit just by answering questions, sharing stuff on Facebook, or clicking on various products!